Over the past 30 years, I have observed well-meaning, naïve pet owners, quite often, turn a perfectly good Labrador into a ferocious monster. And not only does this have devastating effects on their family, but on their dog—for life! He will carry it around forever! Unfortunately, many dogs that end up in shelters are the results of this kind of horrible training and are sentenced to a life in and out of shelters until they finally must be euthanized. THIS NEVER NEEDS TO HAPPEN! Read on to be sure you are shaping your Labrador into the loving, devoted, people-pleasing dog he was bred to be. First of all, I’d like to share from personal experience. After 30 years of dealing with Labradors and the public, I have a journal full of experiences that I can glean from when writing my blogs, and prefer to use ‘real’ experiences—they can be much more poignant. One such story happened sometime in the early 1990’s. I’d placed a Labrador into the hands of a family who’d gone through my rigorous screening, and I’d done my lengthy education over the months leading up to their adoption. Along the way, they gave me no red flags that made me think they were not a good home for my grand-puppy. (By the way, its stories like these that make breeders not want to sell to people who have never had a dog–some will never sell to a family with children!) A couple months later I received a call informing us that our Labrador had “lashed out at the 5/6-year-old girl.” To our dismay, we expressed MUCH concern and took the pup back since that is what a reputable breeder does when something like this happens. In doing so, we took the pup into our family and exposed it to our home, routine, and rules and a variety of people. But when introduced to a young child the age of their daughter the dog growled and cowered. Yep—you guessed it…the child had terrorized, over disciplined and ruined this poor pup. We wisely placed it in a home without children, informed them of this poor dog’s history, and there was never another incident. I’d say, sometime in the early 2000’s I received a call from one of our clients that the puppy they adopted from us had become ‘aggressive,’ lashing out at the “lady of the house.” We took the dog back, knowing that the same thing had happened, only this time the offender was an adult female. We asked about how she had disciplined the dog, and although she was hesitant to reveal the entire story, we could read between the lines that she had made this dog fearful, confused, and scared of her (picture her digging her manicured, long nails into this dog’s snout!). It should be noted that the dog ONLY showed this behavior around this particular woman. We had an almost identical story that involved the “man of the house” and in both cases, it was a long road to healing, but with lots of patience and wisdom, we regained their trust with lots of loving, patient care. They were carefully re-homed and did splendidly. Labrador punishment that is inappropriate would include hitting (obviously! ), swatting at, pinching it, locking them up, or putting him outdoors. Some reasons that you should not severely or “over-correct” your Labrador should seem pretty obvious. Mostly–they just won’t like you! They’ll feel uncomfortable around you, be afraid, or “shy” from people—especially those reaching out a hand to pet them. Pets have a very short memory, too, so correctly them for pooping on the floor when you get home from work (not knowing if it’s been there for hours already) will confuse them. Talking in a firm (not stern or loud) voice is ok, but then positive re-enforcement should follow. Lots of taking them to the RIGHT place to eliminate and lots of praise when it happens. So correcting them quickly and immediately is best. Do not drag them, put their nose in their poop or other things that shame them. And, although its difficult, catching them in the act is the BEST opportunity for correction. Teach them a schedule, especially for eating and potty times. Take them for plenty of walks for opportunities to eliminate before you leave and when you return. A crate can be super helpful in this area and we encourage you to read our crate training manual so that you are using it as a positive training tool and not as punishment. Self-confidence can also be lost if a dog is harshly punished. They may become confused with their decision making power and become neurotic or nervous. AND…they become afraid of people. Be sure to also remain calm. Becoming angry or irritated can also bring negative results. Keep a positive mind-frame when training your Labrador. 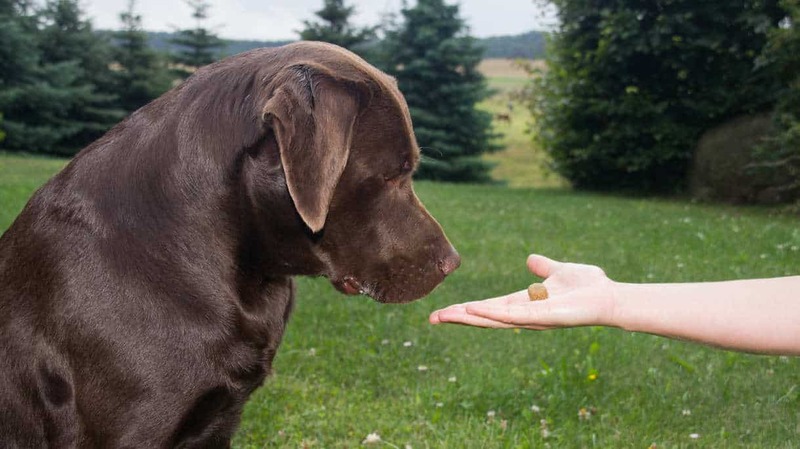 Reward is the most fun part for a Labrador…especially if it includes FOOD! Reward immediately after positive behavior so that they begin to associate the behavior and the reward quickly. A high-pitched sing-songy, happy voice will differentiate from the difference of the “this is not appropriate” voice. If you wait too long– again–they may not learn the positive behavior quickly. Monitor children in your household to be sure they are not terrorizing or “spanking” a puppy like they do their dolls. If they do, respond with appropriate and HARSH (just kidding!) punishment for your child, just as if they have hit their sibling. Make the punishment fit the crime. Be sure it NEVER happens again, even if it means the child is not allowed to be alone with the puppy for quite a long period of time. Be sure the entire family is doing the same corrections and vocabulary so that puppy does not get confused. Be sure you also monitor neighbors when your dog is in a backyard. Just one harassing, nasty bully can ruin a puppy or dog forever. Don’t let this happen either. If it does, correct the neighbor, then contact the parents if a child is the one involved, then prevent your dog from coming into further contact with these individuals. On one last note–and one that is almost opposite of most of what we have gone over–do not let a dog “run over you” or take advantage of you. I’ve seen this turn out negatively as well. On one account, we had a tiny, very shy lady who actually began to be bullied by her very large adolescent dog. It took a larger, more firm trainer to get this dog back under control, and once he was, the lady was advised very seriously to carry through with the training we’d had done. So, as a rule, don’t let them get away with anything as a 10 lb puppy that you don’t want them doing as a 5-year-old, full-grown Labrador. This lady had done EXACTLY the opposite! Trust me, you’ll thank someday for that tip. (wink—smile!) Especially training them with the ‘gag” correction for puppy play biting is most important. If you do not get this under control as an 8 week old, it will come back BIG TIME as a larger puppy “chomper” and be the most frustrating thing to experience. I get phone calls at 3 mos of age from the families who have not thoroughly eliminated “play biting” in the first week after adopting their pup. Refer to our Puppy Play Biting video. I really enjoy your advice. As a former Police trainer you bring up this I never knew. Thanks!!! Awesome advice I have owned several large shelter dogs who were abused previously. With kindness, firmness, and patience they became “great” family pets. Wonderful. Thanks for this article! Big Hug from Angola! This is so helpful. I think that Labradors are so eager to please that when they do something they know isn’t right they are remorseful. I never had to correct my lab. He was just so so good! Thank you for the post. I have no Labrador but your information makes me aware of bad results when punishing any pets. We had a Golden Retriever, great dog. Next a Lab, another great dog. When she was diagnosed w cancer at 15, we called the breeder and reserved 2 from the next litter. We now have two brothers. Both are typical labs, loving, playful, … pleasers. To our surprise One of the boys is aggressive with other dogs. He is now going on 4 and we can’t let him socialize with other dogs. After much outdistance he has accepted my sons greyhound and other dine Pomdki. Now my daughter just got a corgi and we are again concerned. We have a lake home and kids bring their dogs…. Suggestions. Had a trainer visit for private evaluation. I felt she was just discribing my dog to me, thanks but I knew all that.